Wholesale supplier of Cintropur Water Filter systems sold direct to the public. Nationwide network of plumbers who can take care of your installation. We are happy to discuss and provide solutions to your water quality concerns. High Flow rates, low pressure loss. 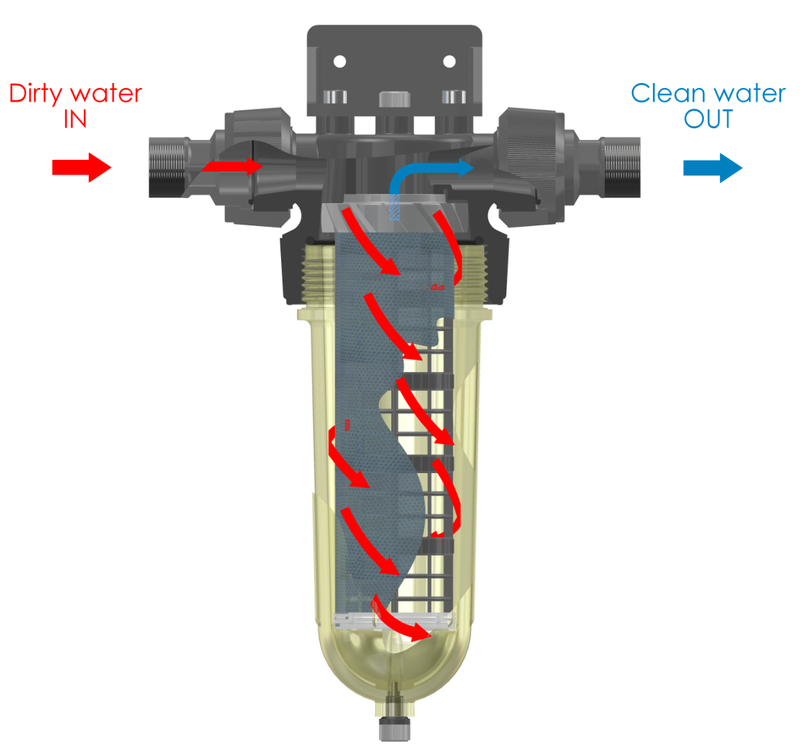 Dual Stage filtration due to hydrocyclone action. Filter Sleeve options: 1 micron Polypropylene. Polyester Disposable 5,10, 25, 50 & 100 micron. Nylon Washable 150 & 300 micron. Economical to maintain, no expensive cartridges. Drain Tap to purge solids. Clear Bowl for inspection of sleeve. Highest Quality manufactured in Europe. Food & Potable water grade, highly resistant materials. "I took some pictures of the water filters, just use the best one, the directors are happy to publish them in your editorial. The filters are doing a fine job by the way! We are using them for our chilled water to get any impurity out to assure best performance in our plant. 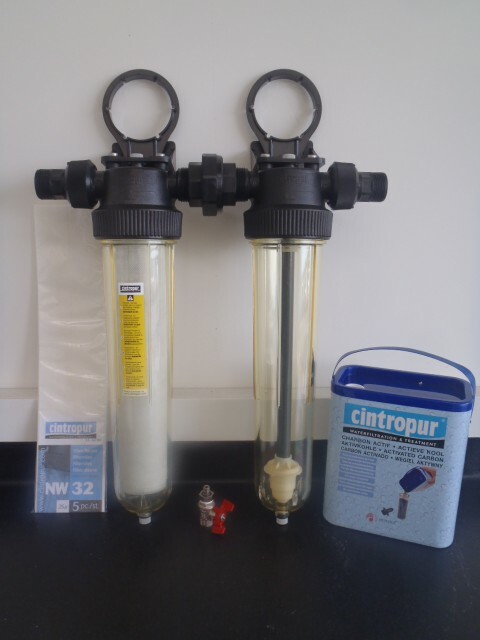 The positives about the filters and Cintropur: easy to install, high flow rate, easy change of filter sleeves, robust construction, good and fast service and support from Cintropur"
"Have fitted both water filters that we bought and we can tell the difference straight away, the coolant is getting cleanner, and pumps are running smoother, I have changed both filter sleeves last week because they looked dirty from the outside and they were dirty, since this is the first time the chillers have run with filters on them we expected that, I feel that it will take longer to the next change because the coolant is far cleanner than what we started with". "Just a quick email to let you know how impressed I was with the water filter system. Usually I find large UV filters with odd connections to plumb to and bulky filters, but your system was far from that. Really impressed how the UV connected to the filters and the 3 other filters fitted together so easily with out using other fittings. The whole unit is tidy and non invasive. Really happy with the outcome. I'm looking forward to working with you in the future". "Hey just want to say thanks so much for fantastic service from you guys. Really appreciated the help and advice and then the very prompt dispatch of the goods". As the Owners of a country lifestyle block we were keen to install a water filtration system that was both effective and easy to maintain. We chose a Cintropur system about 14 months ago as our previously untreated tank water periodically got a bit "whiffy" on occasions. With the easy installation of the Cintropur filter we are pleased to report that the water cleaned up instantly and has worked with minimal maintenance apart from a periodic filter replacement. We are very happy with the system and can report a belch and bellyache-free existence.